Ron is a FANTASTIC MC. Ron truly made the night one to remember as I had multiple guests come up to me after our wedding exclaiming that they have never had a DJ this good at any wedding they've attended. Ron was able to do this, first of all, because of his extensive experience. But he also held a consultation with us when we first booked him. We went through an entire wedding packet together so he could frame the evening we wanted. Then three weeks before our wedding, he had a second consultation to review and finalize all other details. The result was spectacular. He essentially ran the whole show by conducting the introductions, bouquet tosses, speeches, first dance etc. He amicably cooperated and directed all other vendors before the day to ensure everyone would be on the same page. He was classy, funny, energetic as always, and professional! This man delivered on his promise beyond what I could have imagined. We are extremely happy with the service and would recommend him to anyone who is considering a DJ for their wedding. Ron is AMAZING!! He was the best money we spent at our wedding! He is truly a professional and so great at customizing the energy and flow to your specific wants. He gave us HOURS of his time before hand, just planning and getting to know us. He KILLED IT!! The amount of times I've heard "your DJ was amazing" is insane. He had so many ideas and fun touches to keep energy up and the dance floor moving. He does more than just DJ, he really takes control in the most seamless, effortless way and I felt perfectly at peace having our wedding flow in his hands!! We can't appreciate it enough how Ron is our DJ for our wedding! Nothing would go wrong because he would put all he has to ensure everything goes smoothly. Ron is very energetic and is the exact type who would make the dance floor lively. When we had our first telephone conference, his energy made us feel like we are talking to a 20 year old young man. He is also extremely patient and good at figuring out what what we want. He patiently put up with my millions of email and extracted my exact needs. At the wedding, he was possibly the coolest MC imaginable. He is very interactive with all the audience and truly made the reception personable and all about us! If you're looking for someone who will give you the wild time you've always wanted, Ron is your man! Highly recommended!! Ron & Deb make an incredible team. From the get-go, they were incredibly responsive and went above and beyond to really get at what we wanted from the wedding, and how we wanted our guests to feel at the wedding, not just what we wanted to hear! Ron served double duty as both DJ and organizer, helping us understand the flow of the wedding and the points of coordination between each phase. The day of, Ron and team helped ensure that each transition was flawless, allowing us to really enjoy ourselves and our guests without worrying about logistics. Ron also provided uplighting for the day, which made the venue feel incredibly warm despite the cold October weather! Ron was the ultimate professional. From our initial meeting with him to our extensive planning meeting about a month before the wedding, it was a true pleasure working with him! He completely understood the atmosphere we wanted to create for our wedding day and not only helped us to craft a great array of ceremony, cocktail hour and reception music, but he also took on the role of em cee and coordinator for the day, coordinating with our other vendors and paying attention to every detail. Our guests were on the dance floor all night! We had a ball and, in large part, we thank Ron for this! Ron was not only our DJ... he was our wedding mentor and our Master of Ceremonies. My husband and I were living in New Mexico during our four months of planning for our wedding in Massachusetts. Ron was always in contact, accommodating to our busy schedule, and our time zone. After our first conversation we knew we had the right person to make our day wonderful. Our guests had traveled locally and also driven/flown in from all over. We didn't want our wedding to be only about my husband and I, but a night for our family and friends to meet, dance, laugh, have fun, and Dance! Ron exceeded our expectations. Our family and friends are still talking about how much fun the night was and how they made so many new friends on the dance floor. He brought everyone together and we are so grateful! Best night ever! We got so much more than a wedding DJ when we hired Ron Carpenito. What we really got was a seasoned wedding planner who happens to play great music and speaks well on the mic! From day one he organized our wedding and ensured it was exactly how we envisioned it. His timing of the details during our wedding was so thoughtful and seamless. I honestly don't know if our wedding would have been as smooth without him. If you're considering a wedding DJ, look no further, you will not be disappointed! Ron was a very professional and personable wedding Dj. He walked us through the planning phase for the reception and allowed us to feel at ease as the night went on. He was very flexible and adaptive with the curve balls that was thrown his way during the reception and we could not have been more thankful on how he made our night that much better. Ron is a true professional and a great entertainer. Thank you so much! Rarely (especially during wedding planning) do you feel like you get far more than what you pay for, but this was the case with DJ Ron. His services went above and beyond what we had even expected in order to ensure that our reception was exactly how we envisioned it. From the first time we sat down with him (almost a year in advance) we knew we had made the right choice as he genuinely wanted to get to know and help us. Through his coordination, getting to know our friends and family, and top-notch DJing- Ron was the glue that kept the party going strong. He runs an impressive operation and we would highly recommend him to anyone planning an event. This note is long over due!! We had our dream wedding and DJ Ron played a huge part. Our number 1 request was to have a packed dance floor all night long and Ron made this happened. We heard from numerous guests that we had the best music they had ever heard at a wedding and loved the perfect balance of new and old songs. From the first time we met with Ron, we knew he would be the perfect DJ for us. When we met a few weeks before the wedding, we went over the wedding details from start to finish to make sure the night would flow smoothly. Ron then contacted all of our vendors to let them know the plan so that everyone would be on the same page the day of. We wish we could have our reception over and over again, and would ask Ron to DJ without a doubt. You will not be disappointed !!! THANKS, RON!!!! From the moment that my husband James and myself talked to Ron about working our wedding, we knew he had a lot of experience and understood our vision. We've been to a lot of weddings that didn't have a good flow and when talking with Ron you know he will be able to make your day go smoothly. He made a lot of good suggestions in our meeting about what our day would be like, and I'm glad we listened. He is also very professional, he even made a phone appointment with us for a detail meeting even though there was a power outage. We had a medical emergency during our wedding and Ron definitely did a great job taking the spotlight off of that person and making even an issue resolve seamlessly. He did such a great job that at the end of the evening, people just wouldn't leave! And that is a high compliment for an early afternoon wedding that both my husband and my parents thought no one would dance at! But believe me Ron got everyone on the dance floor! I would highly recommend Ron to anyone! He got along great with the wedding party, and made sure everyone knew the schedule, from vendors, to parents, to guests! We still get comments about how great Ron was! Ron was an AMAZING DJ!...but he was so much more than that! He truly was the man responsible for making our entire day run just the way we wanted it to. From the very first planning session I knew this was the guy to trust! He thought of EVERYTHING (even things my wedding planner didn't go over with me!). He gave us unique ideas to help us create the most memorable day and even asked us for potential problems that we foresaw that he promised to watch over. It was seriously like having a guardian angel there on our day! I'd email him for a suggestion and he'd get back to me within the hour with a list of 5-7 song ideas! He was ALWAYS there to talk and go over every detail, no matter how small! At the final planning session, I felt soooo good after leaving! With a wedding fast approaching things can get super stressful, but Ron went over EVERY detail and how we want everything EXACTLY (and gave us some suggestions where we weren't sure) so when I left I could tell you my wedding day down to the nano second. It made us feel so secure and like we were in such great hands! On the day of, he checked in with me and made sure I had everything I needed, and then with all the toasts and cake cutting and speeches, he made sure everything flowed perfectly! He wasn't overbearing or obnoxious or in guests faces, he was just the right amount of entertainer and host and DJ that everyone loved him by the end of the night! And EVERYONE was on the dance floor at some point in the night, and it was never empty!!! Even Greg and I never left the dance floor because song after song was music that we LOVED! Through the whole process Ron was absolutely amazing; even to the point where Greg and I consider him a friend now! He was so nice and helpful and I really just can't say enough great things about him! Don't have any hesitation choosing this DJ...he truly made our day the amazing, unforgettable, unique day that it was. We couldn't have done it without him!!! Ron was amazing! His energy is intoxicating and he keeps the dance floor packed all night! Ron is the type of DJ who is so personable friends and family assumed we had known him for years, and sometimes I feel the same way! His suggestions are on point, his professionalism is unmatched and he genuinely cares about making your wedding a success! Our wedding was a blast, Ron had everyone on the dance floor all night! Working with Ron from the beginning planning process all the way through to our last dance was so easy and stress free! Ron was the most amazing DJ, we would highly recommend! Ron was without a doubt the best vendor we worked with for our wedding. From the first moment we met with him he was highly professional. His approach was to listen and aid us in creating an event that had our best interests in mind. From providing some great ideas to make our wedding a day we would never forget to keeping the mood of the day exactly how we'd envisioned it, he truly over achieved in what he promised us. His services come highly recommended. Ron Carpenito did an exceptional job making sure our wedding reception was exactly as we'd pictured it. He exceeded our expectations about what a DJ would do - meeting with us twice beforehand to talk about our "vision," tastes and preferences, answer questions, and provide guidance about how to create the perfect pace and mood for the entire evening. 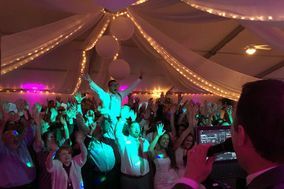 The dance floor was packed all night, and we are still hearing those magic words: "best wedding ever" from our friends! Ron made us feel comfortable from the moment we met him, he is thorough and prepared exactly what we wanted in a DJ, we would recommend him to anyone and everyone who was in the market for a wedding Dj! Ron was an amazing DJ, he had everyone up on their feet the entire night. If I could give Ron higher then a 5 I would! The entire planning process went very well since we live in Florida and he is Mass, he specifically made phone times with us and would call us right on the dot every time, and we also had a skype meeting with him. He is very professional, friendly, and definitely has a GREAT personality and knows how to pick perfect music for such a special occasion. I would 100% recommend and refer all my friends/family to Ron! Thank you so much Ron, you were great! Ron was really great to work with before, during, and after our wedding. He listened to our ideas and was able to give us honest feedback. Everyone at our wedding raved about our DJ, without him our wedding wouldn't have been as upbeat or fun. My husband and I loved our wedding reception, and Ron was a huge part of the reason why! My husband and I loved Ron from the beginning. He was very polite, outgoing, and professional. We loved all of his ideas and how he was determined to make our wedding about us and what we wanted. He went over a plan of the wedding before hand and also kept in contact with our other vendors to keep everyone in the loop. The day of the wedding he was right there beside our wedding coordinator helping move things along. He got our crowd out on the floor right away and kept them there. Everyone raved about him and had an absolute blast!! We loved him and would recommend him to everyone!! We were fortunate to find Ron through a friend who had also had him DJ at their wedding. Ron had an amazing way of helping us to figure out what was most important to us at our reception - we wanted people from both sides to mesh together and have a great time in an unpretentious setting. He stayed completely focused on what was important to us throughout all the planning and during the reception. Sometimes when I go to a wedding, I get the feeling that the DJ is looking at it as his show and a performance of sorts. With Ron, that was definitely not the case. We talked through enough of our likes and dislikes beforehand in terms of music, and then left the rest up to his expertise. He delivered on his promise of getting everyone up and dancing all night. He also acted as the coordinator and helped us think through the flow and format of the reception - when we should do speeches, what kinds of other presentations we'd like to have and how we'd like to honor some of our most special guests. Some of this I hadn't even thought of in advance. I can't emphasize enough how important the DJ is to the vibe of a reception. We heard from a lot of people after our wedding about how much fun they had at our reception, and I really credit much of that to Ron. My husband and I knew that we wanted the music at our wedding to get people, of all ages, up and dancing and that was really important to us. I was nervous because I had been to weddings where the music was cheesy and uninspiring. This was NOT the case with Ron! He did an amazing, professional job DJ-ing our wedding. Not only did Ron just show up the day of the wedding but he met with us several times in the months leading up to our wedding to make sure every detail was covered and that we felt really comfortable with everything. On the actual wedding day, I could not have asked for better dance music! Ron had the entire wedding dancing the whole night with a wonderful variety of music. He played the classics (and nothing cheesy!) and also included more recent dance music. Our guests told us afterwards that they had never been to a wedding with such a great DJ. If you are looking for a DJ for your upcoming wedding, please talk to Ron! He is so professional, responsive, and most of all will do an amazing job at your event. I recommend him 100%!! DJ Ron is great, even our guests commented on how fantastic the music was. Ladies DJ Ron is a must for your wedding!!!!!! !